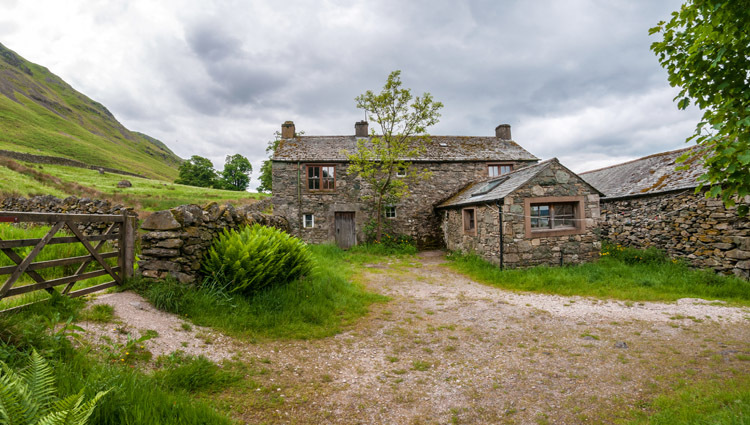 Auterstone Cottage: Swarthbeck Farm Holiday Cottages on the shore of Ullswater in the center of the Lake District, Howtown, Penrith, Cumbria. CA10 2ND. Auterstone Cottage sleeps up to 8 people. This is the most isolated of our properties and much favoured by the many regular visitors who love it in all seasons inspite of the long track which can be difficult in snow or ice. There are wonderful views over the whole lake from the front, and an enclosed yard to the side. As with all properties, there is direct access to the fell. Due to the configuration of this very old house (dating from the 17th century) the bathroom is situated downstairs. There is table tennis in the barn. On the first floor there are four bedrooms, one double, two with twin beds (one reached through the other) and one with bunk beds. On the ground floor are the kitchen/ dining room, living room, bathroom and larder. Heating is by an electric fire (in the living room) and night store heaters throughout the rest of the cottage. Hot water is provided by electric immersion heater (powered by off peak electricity with booster for use during the day as required).